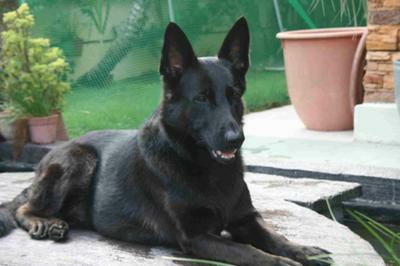 OKay, we just got our Black GSD on the 29th of April. Hes is 9 weeks old now. Hes always on my leg (mounting it or chewing at my pants or feet). Total German Shepherd: You need to get him into training asap. In fact, you all need to go to a dog training class to learn how to work with your new German Shepherd puppy. Going to an actual puppy training class is best because it also offers a lot of socialization benefits too - or having a trainer come to you is also very good if you can afford it. But if you can't do that, then doing it yourself is okay if you feel comfortable enough to do it. There are many other courses in bookstores and online as well - but I will recommend if you want to do it yourself to check out either of the banners I'll put on this page to learn even more about this particular dog training course.